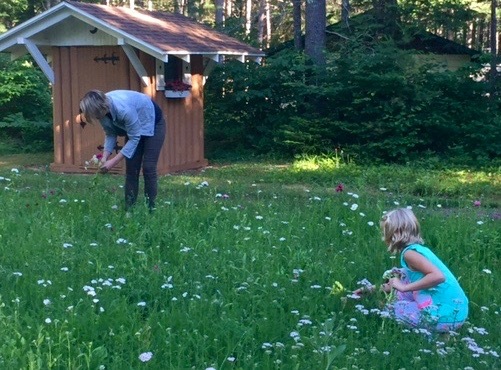 Six years ago my in-laws planted a garden full of Sweet Williams at their Lodge in Minocqua, WI. That summer, then two-year-old Hallie and her Aunt Chandi - a talented florist - spent many a morning picking and creating bouquets of these gorgeous flowers which, because she couldn't quite remember their moniker, Hallie renamed Will Sweeties. As is often the case with children's mispronunciations, the new name stuck and we still today refer to our favorite flower as Will Sweeties. 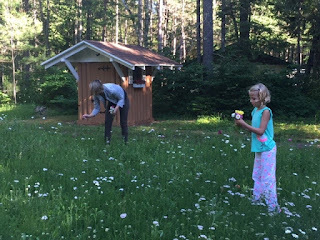 Within minutes of their reunification at the Lodge last week, now eight-year-old Hallie and her Aunt Chandi found their way back to the garden full of Will Sweeties. In some ways, six years makes a world of difference...and in other ways, nothing much has changed. One of the things that hasn't changed? Hallie still picks flowers wearing her pajamas.